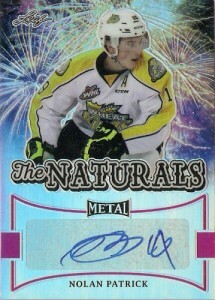 Featuring former greats, current stars and top hockey prospects on a chromium design, 2015-16 Leaf Metal Hockey relies on several inserts and multiple parallels in an all-autograph release. Each hobby box includes five signed cards. 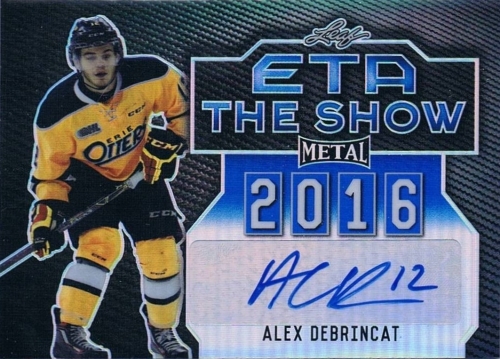 Metal Autographs is essentially the base set with a simple design and various signed inserts provide more to collect, including ETA The Show Autographs that highlight projected first-round picks. 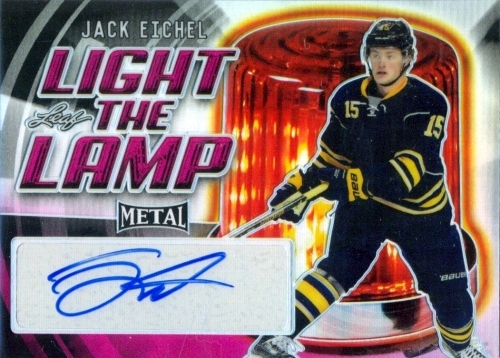 Light the Lamp Autographs also focus on the future with scoring threats and The Naturals Autographs cover future stars like Jack Eichel, Matthew Tkachuk and Jesse Puljujarvi. Pride of the Name Autographs mix new and old stars in an insert that is centered on their home country. Early names include Pavel Bure, Guy LaFleur and Vladislav Tretiak. Featuring former greats, Immortals Autographs look to the past with a checklist that includes Martin Brodeur, Steve Yzerman and Patrick Roy. 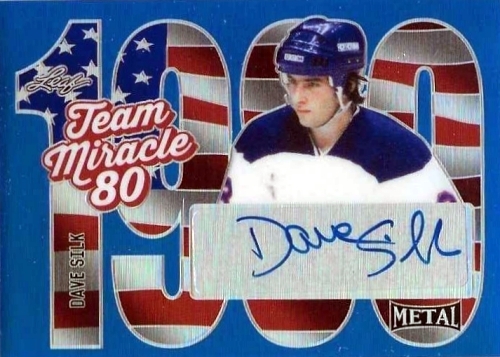 Team Miracle '80 Autographs remember the legendary Miracle on Ice squad with a 17-card set. 2015-16 Leaf Metal Hockey is further expanded with eight different parallel colors of varying rarity for the signed sets. Marking his debut, Joe Veleno is a young phenom (and only 16) who is featured as a Leaf exclusive. 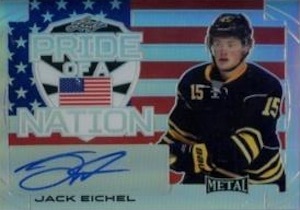 Another Leaf exclusive, Jack Eichel autographs average one per case. 2016-17 LEAF METAL BLUE PRISMACTIC AUTO JAKE KRYSKI #BA-JK1 (5 25). PARALLEL CARDS: Blue #/25, Purple #/15, Pink #/10, Black #/7, Green #/5, Red #/3, Gold 1/1, Gold Super 1/1, Printing Plates 1/1. PARALLEL CARDS: Blue #/15, Purple #/10, Pink #/7, Black #/5, Green #/3, Red #/2, Gold 1/1, Gold Super 1/1, Printing Plates 1/1. PARALLEL CARDS: Blue #/7 or #/3, Purple #/3 or #/2, Pink #/2, Black 1/1, Green 1/1, Red 1/1, Gold 1/1, Gold Super 1/1, Printing Plates 1/1. 17 cards. Serial numbered #/25. I’m a fan of the no-nonsense, 5 cards per pack. I’ll be testing this one out for sure. This product is pretty solid. A large majority of the best undrafted prospects are there. Very easy to pull low-numbered autographs of decent prospects. I usually don’t love leaf product but this ones rocks. Seems like every box has a special card. 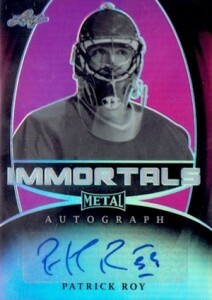 When the prospects are so-so, there is always a pretty decent card of a legend. The only thing that I dislike in this thing is the 80’s heroes. I mean all these players had a little career in nhl or didn’t even play in it. In a box, I was pretty lucky. 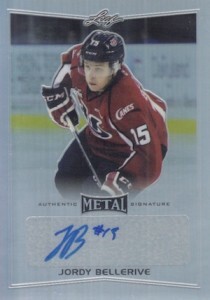 I also got Julien Gauthier who will likely end-up being draft around 12-18 in the upcoming draft. So sick of the games these companies play, killing us (their reason of a paycheck). Good to see Leaf lcok of Eichel to stick it to UD, but of course UD had to do the same with McDavid to screw over guys like me who love Leaf. Of course UD gets screwed alll over the place, and now it’s impossible to make even College cards, because Panini gets right to all these colleges-merely to choke out the competition, make as much money as they can….until it backfires and we all are so sick of their crap and take a massive s*** all over the hobby.